Kaitlyn Dever: Hollywood is “harder than you think” – Live! Starring ... You! 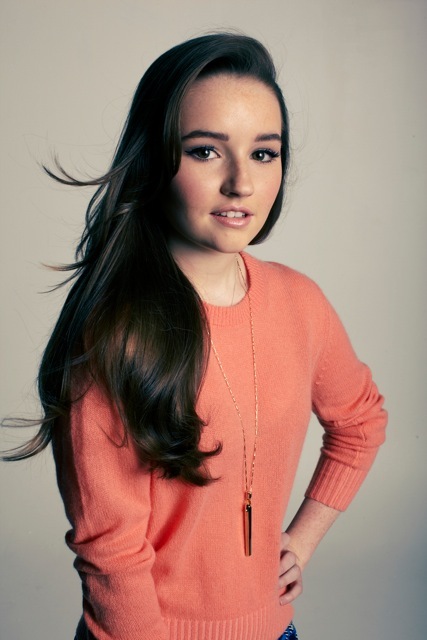 At 16, Kaitlyn Dever is deep into her Hollywood career and says learning the way the business works has been key to her success. Kaitlyn Dever has been working in Los Angeles since age 10, living there full time since 13, and now – at 16 – she’s a Hollywood veteran. Currently Tim Allen’s co-star on the ABC television show Last Man Standing, Kaitlyn has worked on a long list of big projects with big names, from J. Edgar (Leonardo DiCaprio) to Bad Teacher (Justin Timberlake) and more. As you think about your life and career today, what is something that you would never have expected? Kaitlyn: Probably to work with all these amazing actors. I never would have even expected this to happen. I’ve been so blessed to be able to have done what I’ve done so far. It’s been my dream since I was 6 years old. As you became more and more famous did people start treating you differently, like your friends at school? Kaitlyn: No, not really. I’m home schooled so it’s a little different. My friends back at home, back in Dallas, don’t really treat me any different. I’m always texting my friends back home. Here, I make a lot of friends with other actors too so they kind of understand where I’m coming from. Do you generally find it easier to make those connections with the other actors and actresses than with people who aren’t on the inside of that life? Kaitlyn: Yeah, it is definitely a lot easier because we have a lot more in common. I’ve made a lot of friends out here just by working with them and meeting them through mutual friends. That was one thing I was worried about coming out here when I was about 10 years old. I didn’t have a lot of friends so I was often going back to Texas and hanging out with those friends. But since I was 10 I made a lot of friends who I am very lucky to have. I have a lot of friends who are actors and go to real school and then I meet other kids who go to high school, and I actually think it’s cool. I like to have diversity. What is something about this business that no one ever knows until they’re in it? Kaitlyn: When I first came out here, I though it was going to be very easy. At first, it was. I booked the first thing I went out on which was a Mattel Barbie commercial. But something that people don’t know when they’re coming in to it is that it’s hard. When you really want a role and don’t get it, it’s hard to deal with. It’s a lot of no’s, but you just have to keep doing what you love. That’s what I’ve been doing. I’ve gotten a lot of no’s but I’ve gotten to work with a lot of amazing people so that’s why I keep going and doing what I love. Does rejection now sting any less because you know you’ve had some success? Kaitlyn: When I was first coming out here and auditioning, it was a little harder to deal with, because I didn’t understand. I was one of those people who thought, “Oh, it’s so easy. I’ll just go and audition and I’ll get it.” But it’s harder than you think. Now I understand it’s harder, so I don’t really take it in as badly as I used to. Now, it’s more like, “That’s OK, I didn’t get that role. I’ll work hard; there’s always a next time.” I understand the business a lot better. Is it helpful that you’ve gotten great roles, or is it more that you understand the business? Kaitlyn: It is a little bit of both. I understand it better, and I’ve been in the business a little bit longer. Kaitlyn: I’ll definitely stay in the business and definitely keep doing acting for the rest of my life, but if I go to college I’ll probably go to school for directing or writing. I just love this business. I never really picture myself going out of the business and doing something else. I’ll probably do acting for the rest of my life, and if I want to do something different just to mix it up a bit, I’ll probably do directing.